I thought when B and Weedy went off to sunnier climes for a whopping 11 days that I was going to struggle a bit to keep active – but not a bit of it. I have been busier, more sociable than I could have imagined – and I have felt good too. And still it isn’t stopping. Friend coming over for the day shortly, Bridge tonight, work meeting tomorrow followed by a birthday bash, Canny Ken on thursday eve – may even try and blag a Friday night dinner on… Friday night. And Ashes to watch till 1 a.m. every night/morning. Look, just in case you missed – here is that brilliant One Ronnie sketch that’s doing the rounds – enjoy. Weedy and B are struggling a bit with the weather. The temperature their thermometer is showing is close to ours – except that they are on the Centigrade scale while we are on Fahrenheit – and they are finding it a bit too hot. I ventured out to the local shops this afternoon. Wow – biting cold. The snow/ice is treacherous now. I have my iPod (iPhone, really) on and listening to my fave tunes on shuffle. Watch Your Step by Elvis Costello came on. 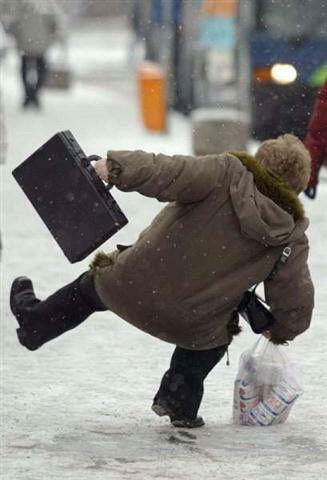 I slipped on the ice. I later went out to Sainsbury’s to do a pre-Xmas shop – not that I needed much but I knew shops would be closed for a few days soon so best stock up. Some would say it was folly to go anywhere near a supermarket so close to Xmas – but, bizarrely, it was not busy at all. I went in, did a bit of shopping, and did not need to queue at all at the till. Shimples. B found out from t’internet that the RAF Museum in Hendon was celebrating St. Andrews Day with lots of activities for children – including something about The Flying Scotsman. Apart from its name, quite what a train has to do with the RAF I am not entirely sure – but if you think I was going to pass up on an opportunity to take Weedy 5 mins down the road for an exhibition about trains and planes – you don’t know my Weedy! So off we went. I asked at reception where the St. Andrews Day activities were taking place. Reception didn’t know there were any. She phoned someone up. They hadn’t heard of anything either and suggested I had the wrong place. Then the phone rang – and it was the information that, yes indeed, there are some activities to be found in the children’s area. I guess that much I could have probably worked out myself. So we made for the children’s area and looked around for a life-size replica of The Flying Scotsman – or maybe even the real thing – or at least some people dressed up as… ah, here’s a (wo)manned information desk. Excuse me… yada yada… Flying doobree wotsit… yada yada… where? Oh, it’s on that table. She said this as she pointed to a little table about 3 feet away. On said table, were some blank sheets of A4 paper. You can make your paper aeroplane with those – but please don’t fly them in the main hall. So, that was it – we went all that way (5 mins drive… but that’s not the point!) for a piece of blank paper! We made our aeroplanes. I made one too – well, had to get my money’s worth! And flew them, carefully avoiding the main hall – for fear of damaging any of the fighter jets that had withstood the might of the Luftwaffe 70 years ago! After about, oh, 16 seconds, we decided to have a look around the museum – at one point we went up some stairs to view inside a cockpit. Oh look there’s a British Airways thingy – shouts Weedy, as he races down the same flight of stairs. However, in his haste and excitement, he lost his footing half way down and went… flying. Crash Bang Wallop. Thankfully not Snap Crackle and Pop! He was very shocked at the bottom and did what any 6 year old would do. I genuinely think he would have hurt himself a lot more and probably caused a lot more damage were it not for the fact that he is very floppy-limbed – a bit rubbery. He seemed to just bounce down the stairs. I had to get out my iPhone – let him play with it for a few minutes – till he forgot about it and was able to walk around again. I hear it also makes phone calls, y’know. I had an appointment with Smiler today. He is confused. He just cant decide what to do. I think it’s been troubling him since our previous visit. And he still seeks the answer. Whether to get an iPhone or stick with Blackberry. It’s a toughie I know. But then you know my feeling on this. If you get a Blackberry first, you’ll love it – it’s a great tool. Great for phoning, for texting, for emails. But if you then get an iPhone – ah, there your world will change. Crap phone, Crap texter, Crap battery, not bad for emails. But Brilliant for Apps (Yippee!!). And Music! And cool factor – even after all this time – it is still the coolest thing on the planet. So Smiler, are you cool enough? On a less serious front, there are strange goings on with my liver – well, the portal vein that feeds my liver. Y’see, back in March it was totally blocked. Now, following an Ultrasound scan, it is found to be letting blood flow. So, I am having an MRI on Monday and Smiler cant wait to see the result. Unfortnately this new finding will not imply a decrease in the need for a transplant – it just means that I may be in better health for it. Bah! So, Monday MRI. Tuesday, Platelet transfusion prior to teeth extraction. Both the MRI and the transfusion require canulas. Have I ever mentioned my deep fondness for canulas? But Smiler said I should ask the MRI peeps to leave it in so I can go home with it and go to t’other hosp the next day for the transfusion. That, for me, is a result! One final footnote – I got a call from the hospital thats doing the transfusion following a blood test I had to have a week before the real deal. They phoned to ask me if I was taking Warfarin (corroct spilling?). Y’see Warfarin is a blood thinning agent – and they couldn’t believe that my platelet count was so low – without taking it! Ha! Well I thought it was funny – guess you had to be there. For months now I have been singing… shouting… my praises of the revolutionary gadget that is taking over the world – the Apple iPhone – of course! It can do almost anything. You name it. Well, let me tell you, the iPhone can do all of that – but also now gets rid of unwanted guests! Y’see, it’s got a new App on it – that is the sound of the dreaded drone of the VUVUSELA!!!!!! So wherever you are you can make yourself the most annoying person in the world – in an instant – whether you have relatives over for dinner and they are overstaying… or perhaps when you are at a party, or, dare I say it, a Bridge evening (gulp!) – or simply just want to piss off the wife. But, a word of warning – buy yourself an iPad too. It has a good screen for reading books and newspapers – you’ll need that ‘cos you wont have any friends! Tuesday is a busy day. It always has been – and today is no exception. It goes like this… give or take. Get woken up at 6am by Weedy – rummaging around my drawers (oo-er, missus) looking for my iPhone. Actually B and I differ greatly on Weedy’s use of the iPhone – we dont really discuss our disagreement too much on account of the fact that we both know we are right – we just have to find a way of sneakily making our way happen. The bottom line is – Weedy knows his way round the iPhone like the back of his hand – but I dont have games on it – I have these basic Apps that are both fun and informative for a 5 yr old e.g. the maps. Weedy loves maps. Street Maps, Town Maps, Motorway maps, country maps – he can literally sit on the floor quiet as a … quiet thing and travel from the road we live in all the way to … Liverpool. He likes the Planets App. it’s pretty darn cool. Immense actually. He likes the Doodle App – where he can draw pictures. And of course YouTube. Now he is only 5 and you might say – you shouldn’t let a 5 yr old loose on YouTube – you never know what he might stumble upon – but I tell you – he can type “bus” and he can type “train” and can type “and” – and so he sits in front of the screen selecting videos of buses and trains – and he is happy as Larr… Weedy. Unfortunately, B is not happy. I’m not really sure why – but she does not want him to be using the iPhone. And I hear some of you saying – hey David this is a bit unfair using your blog to state your side of an argument without offering your wife her side of the argument – if you have something that needs discussing then you should put the laptop down and discuss it – well, I ‘ll respond to that in 3 ways – 1) You’re right, 2) I dont have anything to discuss and 3) there is a comments box at the bottom for responses to be made. Ok, option 3 is a bit of a throwaway comment (actually so are 1 and 2) – but let me ask you this. Is it better for B and I to get another hour or so of blissful sleep and for B to be quietly planning the route from Barnet to Ashby de la Zouch or would we rather listen to him rummaging around clothes, drawers and cupboards looking for something we have clearly hidden and he has no chance of finding? Hey, I might even find one day that he has done my blog for the day…. then we’d all know how to get from Barnet to Ashby de la Zouch! So, back to my schedule. Take Weedy (sometimes) to school and return – one hour round trip… give or take. Do some work. Leave at 11:00 for BNI business networking meeting – till about 14:00-ish. Tomorrow I have a meeting in Barnet at 15:00 with two inspiring people – Kesh, who runs thebestofBrent and who is officially the most connected person in North London (rats – that includes me!) and Mark Shaw who is a Twitter extraordinaire and all round decent bloke. And back home (unless I can fit in a another business meeting in Barnet) for a bite to eat with my boy (maybe a little play with the iPhone), followed by the Weedy routine – you know pee, poo, a little read of the junior encyclopedia (hmmm… more educational…no.. dont go there), bath, jim jams, teeth, a few corny daddy jokes, bed, and then I’m off out for the evening to play Bridge (not always as relaxing as you might think – that last bit… but I think I’ll leave that one hanging…). Now, that Ladies and Cheltenham, is one long day – even without a dodgy liver. Good job I drafted the blog the night before , HA!